Expressed Sequence Tag (EST) sequences are widely used in applications such as genome annotation, gene discovery and gene expression studies. However, some of GenBank dbEST sequences have proven to be “unclean”. Identification of cDNA termini/ends and their structures in raw ESTs not only facilitates data quality control and accurate delineation of transcription ends, but also furthers our understanding of the potential sources of data abnormalities/errors present in the wet-lab procedures for cDNA library construction. After analyzing a total of 309,976 raw Pinus taeda ESTs, we uncovered many distinct variations of cDNA termini, some of which prove to be good indicators of wet-lab artifacts, and characterized each raw EST by its cDNA terminus structure patterns. 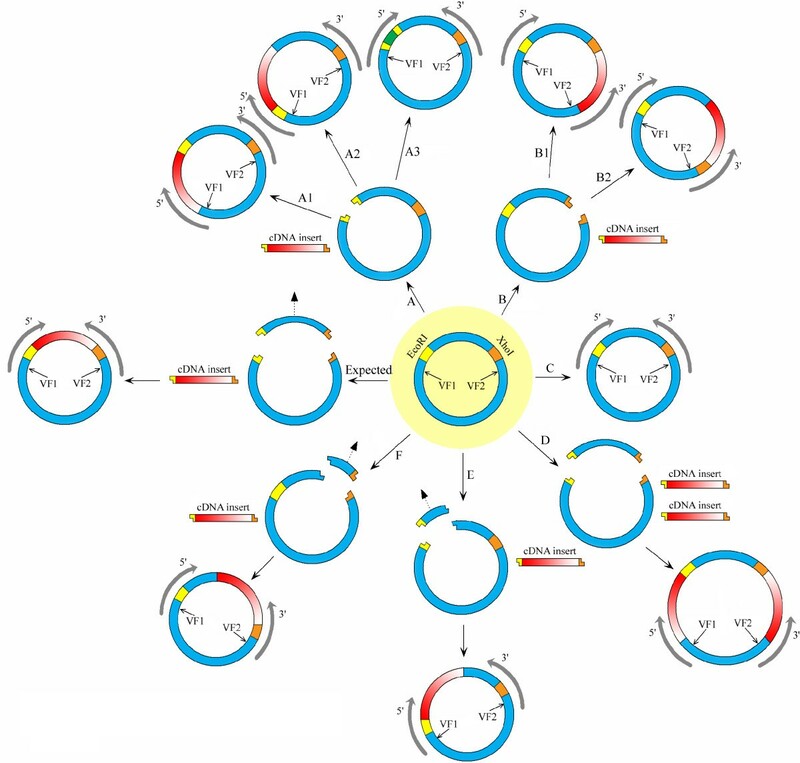 In contrast to the expected patterns, many ESTs displayed complex and/or abnormal patterns that represent potential wet-lab errors such as: a failure of one or both of the restriction enzymes to cut the plasmid vector; a failure of the restriction enzymes to cut the vector at the correct positions; the insertion of two cDNA inserts into a single vector; the insertion of multiple and/or concatenated adapters/linkers; the presence of 3′-end terminal structures in designated 5′-end sequences or vice versa; and so on. With a close examination of these artifacts, many problematic ESTs that have been deposited into public databases by conventional bioinformatics pipelines or tools could be cleaned or filtered by our methodology. We developed a software tool for Abnormality Filtering and Sequence Trimming for ESTs (AFST, http://code.google.com/p/afst/) using a pattern analysis approach. To compare AFST with other pipelines that submitted ESTs into dbEST, we reprocessed 230,783 Pinus taeda and 38,709 Arachis hypogaea GenBank ESTs. We found 7.4% of Pinus taeda and 29.2% of Arachis hypogaea GenBank ESTs are “unclean” or abnormal, all of which could be cleaned or filtered by AFST. 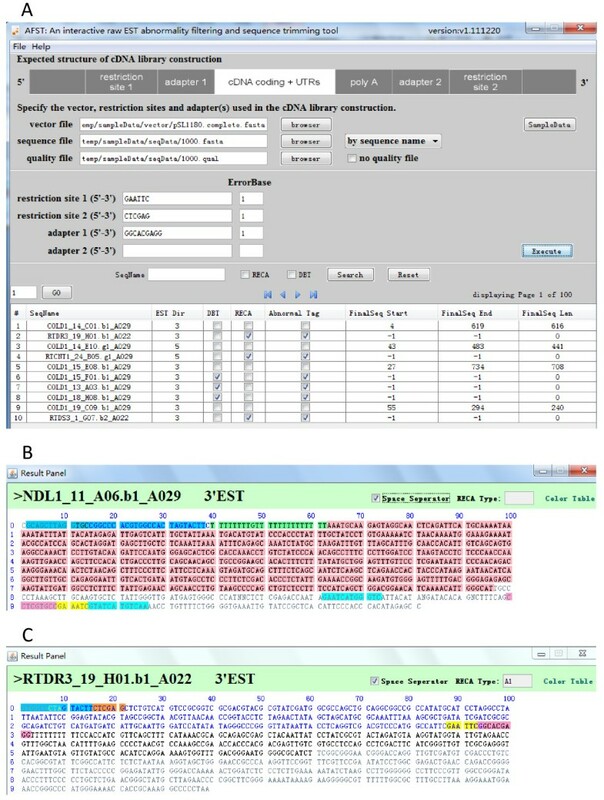 cDNA terminal pattern analysis, as implemented in the AFST software tool, can be utilized to reveal wet-lab errors such as restriction enzyme cutting abnormities and chimeric EST sequences, detect various data abnormalities embedded in existing Sanger EST datasets, improve the accuracy of identifying and extracting bona fide cDNA inserts from raw ESTs, and therefore greatly benefit downstream EST-based applications. ESTs are primarily cDNA sequences obtained by sequencing cDNA fragments/clones made from mRNAs. Representing transcribed portions of various genomes, ESTs are widely used for a variety of genomic researches, including novel gene discovery, gene expression studies, and genome annotation [1–8]. While cDNA/EST data generated by next-generation sequencing technologies (such as 454 or Illumina) is being deposited into the NCBI Short Read Archive (http://www.ncbi.nlm.nih.gov/Traces/sra/sra.cgi) in an unprecedented rate, the quantity of publically available EST data created by traditional Sanger sequencing is still increasing. As of November 1, 2011, there were 71,235,293 entries deposited in the GenBank dbEST, the public data repository for traditional Sanger ESTs . Unfortunately, many EST datasets are poorly processed, and GenBank dbEST contains numerous errors from a range of sources. For example, double-termini adapters, the palindrome linker sequences that likely concatenate two different transcripts to form chimeric ESTs, were identified in many Pinus teada ESTs . In another case, we were able to identify a number of spurious sequence remnants (i.e. vector or adapter fragments) in a large portion of the GenBank ESTs and their clusters/contigs for Chlamydomonas reinhardtii, an artifact of under-trimming during the procedures of raw EST cleanup. In order to significantly reduce the errors in public EST databases, we proposed a protocol that processes raw EST data based on cDNA termini/ends – a set of diagnostic sequence elements that can be used to delineate cDNA insert ends and facilitate extraction of bona fide cDNA insert sequences from raw ESTs [11, 12]. Specifically, the diagnostic sequence elements for cDNA termini include adapter/linker sequences, insert-flanking restriction enzyme recognition sites, poly (A)/(T) tails, and plasmid vector fragments immediately adjacent to cDNA inserts. Moreover, these individual elements or components must have retained their sequential order and orientation constraints and form a canonical or expected structure for a given cDNA terminus, known as the cDNA terminus structure . Our previous work [11, 12] focused on detecting canonical cDNA terminal structures expected from the adopted cDNA library constructional protocols and filtering out those ESTs with abnormal and complex terminal structures for downstream applications. In this study, we have collected a total of 309,976 raw Pinus taeda EST trace files, the majority of which have been submitted to both NCBI dbEST and Trace Archive. Using this dataset, our objective is to characterize the abnormal and complex terminus structure patterns, explore the potential underlying sources of wet-lab artifacts/errors, and develop a new EST cleaning software tool based on pattern analysis approach. Using our new tool, we have reprocessed 230,783 Pinus taeda and 38,709 Arachis hypogaea GenBank ESTs, and detected a significant number of problematic EST sequences. Clearly, characterization of abnormal and complex terminal structures will improve current EST cleaning steps and facilitate the quality control of error-prone ESTs. In our previous studies [11, 12], we defined four canonical cDNA termini: 5′ terminus of the cDNA in the sense strand (5TSS), 3′ terminus of the cDNA in the sense strand (3TSS), 5′ terminus of the cDNA in the non-sense (anti-sense) strand (5TNS), and 3′ terminus of the cDNA in the non-sense strand (3TNS). In particular, 5TSS and 3TSS denote the 5′ and 3′ ends of the relevant mRNA, respectively, in the sense strand, whereas 5TNS and 3TNS delineate the 3′ and 5′ ends of an mRNA, respectively, and whose sequences are read in the 5′ → 3′ direction in the non-sense strand. In order to better characterize the abnormal and complex terminus structures, in this study we have expanded our cDNA terminus definitions by adding more sub-components, as shown in Figure 1. For example, 3TSS-1 represents the combination of a poly(A) tail and a XhoI site (CTCGAG, Enzyme2); 3TSS-2 denotes the combination of a XhoI site (CTCGAG, Enzyme2) and the adjacent plasmid vector fragment marked as Vector fragment 2 (VF2); 3TSS-3 represents the poly(A) tail; 3TSS-4 denotes direct adjunction of a poly(A) tail, a guanine (G) instead of a XhoI site (CTCGAG, Enzyme2), and the vector fragment VF2, which is impossible in theory; and 3TSS-5 stands only for the vector fragment VF2. In Figure 1VF1 and VF2 are referred to the left and right vector borders of the cloning sites. The expanded definitions of cDNA terminal structures. The original four canonical cDNA termini – 5TSS, 3TSS, 5TNS and 3TNS  have been expanded by adding some sub-categories. Using the same or similar cDNA library construction protocol illustrated in Figure 1, 309,976 raw ESTs for Pinus teada were generated by three different labs – UGALAB (172,229), NCSUFBG (75,001) and TIGR_JCVIJTC (62,746). Among the UGALAB ESTs, we found that 82% (141,914 out of 172,229) contain detectable cDNA termini. Of those, about 38% (54,112 out of 141,914) match the expected terminal structures described in Figure 1, while 62% (87,802 out of 141,914) possessed abnormal terminal structures that were different from the expected structures. In contrast, among the ESTs from NCSUFBG and TIGR_JCVIJTC, 94% (70,589 out of 75,001) and 99% (62,253 out of 62,746) have detectable cDNA termini respectively. Of the identified ESTs, NCSUFBG has 68% (47,845 out of 70,589) with the expected cDNA terminal structures and 32% (22,744 out of 70,589) with abnormal terminal structures, whereas TIGR_JCVIJTC has 44% (27,368 out of 62,253) with expected cDNA terminal structures and 56% (34,885 out of 62,253) with abnormal terminal structures. Clearly, ESTs from UGALGB display more complex cDNA terminal patterns than the other two data sources. Table 1 lists the most frequent abnormal patterns of cDNA termini detected in the 172,229 UGALAB ESTs generated using the exact protocol shown in Figure 1. The most frequent pattern (Case No.1, making up 30.74% of all 5′-end ESTs) is a single or multiple poly(A) fragments identified near the end of 5′-EST sequences without either a flanking XhoI enzyme site or the vector fragment VF2 in proximity (Additional file 1: Figure S1 A). The second most frequent pattern (Case No. 2, 9.28%) is the replacement of a XhoI site (CTCGAG, Enzyme2) by a single Cytosine (C) that is flanked by the vector fragment VF2 in the front and by the poly(T) tail at the end in 3′-end ESTs (see 5TNS-4 in Figure 1 and Additional file 1: Figure S1 B). The counterpart pattern of Case No. 2 in 5′-end ESTs is Case No. 8 (0.90%) where a XhoI site (CTCGAG) is replaced by a single Guanine (G) that is flanked by the poly(A) tail in the front and by the vector fragment VF2 at the end in the sense strand of cDNA (see 3TSS-4 in Figure 1 and Additional file 1: Figure S1 C). The cDNA terminal pattern Cases No. 3 (8.21%, Additional file 1: Figure S1 D), No. 4 (1.59%, Additional file 1: Figure S1 E), No. 6 (1.49%, Additional file 1: Figure S1 F) and No. 7 (0.98%, Additional file 1: Figure S1 G) reflect the common theme: cDNA inserts are not flanked by a poly(A)/poly(T) tail near 3TSS or 5TNS, but flanked by either the vector fragment VF2 or by an XhoI site plus VF2. This theme is theoretically impossible because polyadenylated mRNAs were captured for reverse transcription reaction during the cDNA library construction in terms of the protocol shown in Figure 1. Among the most frequent patterns, Case No. 5 (1.55%, Additional file 1: Figure S1 H) indicates that designated 5′-end ESTs possess 3′-end like cDNA terminal structures. While the frequency distributions listed here are based on the UGALAB ESTs, an analysis of ESTs from NCSUFBG or TIGR_JCVIJTC leads to similar results. tail and XhoI site detected. XhoI site (CTCGAG) is replaced by G.
1V stands for vector sequence while N stands for non-vector sequence. 3 Of 172,229 ESTs, 83,021 are designated as 3′-ESTs (with ".b" in their sequence names) whereas 89,208 as 5′-ESTs (".g" in their sequence names). The percentage is calculated using the total sequence number for each case divided by all 3′-end or 5′-end ESTs. 4All examples are displayed in Additional file 1: Figure S1. Because of low frequencies in occurrence, a number of more complicated abnormal patterns of cDNA termini are not listed in Table 1. Among them, interestingly, is a set of patterns that reveal Restriction Enzyme Cutting Abnormality (RECA), as summarized in Table 2 and shown in Figure 2. It is known that, for a given cDNA library construction protocol using a specific plasmid vector (see Figure 1 for an example), the vector sequence between the two restriction enzyme (e.g., EcoRI and XhoI) recognition sites should be completely removed prior to the concatenation of a cDNA insert. However, our pattern analysis approach revealed that many variants of cDNA terminus structure patterns can indicate possible wet-lab abnormalities during the restriction enzyme digestion procedure. Neither of the two enzyme sites is cut off. Both the two enzyme sites are cut off, but the vector fragment that should be removed still remains. XhoI cuts off at wrong site from the vector. EcoRI cuts off at wrong site from the vector. The expected construction of cDNA insertion and all types of Restriction Enzyme Cutting Abnormality (RECA). The label “Expected” means the expected construction of cDNA library. Sequencing direction is indicated as 3′ or 5′ with an arrow. VF1 (Vector fragment 1) and VF2 (Vector fragment 2) are referred to the left and right vector borders of the cloning sites. A, B, C, D, E and F are special types of RECA, defined as following: RECA-Type A: EcoRI site is cut off but XhoI site remains intact. A1: cDNA is inserted with inversion; A2: cDNA is inserted without inversion; A3: Adapter/linker fragments are inserted. RECA-Type B: XhoI site is cut off but EcoRI site remains intact. B1: cDNA is inserted with inversion; B2: cDNA is inserted without inversion. RECA-Type C: Neither of the two enzyme sites is cut off. RECA-Type D: Both the two enzyme sites are cut off, but the excised vector fragment remains. RECA-Type E: XhoI cuts off the vector at wrong site. RECA-Type F: EcoRI cuts off the vector at wrong site. The yellow color indicates EcoRI recognition site or EcoRI sticky end. The brown color stands for XhoI recognition site or XhoI sticky end. The blue represents the plasmid vector. Dark green denotes for adapter/linker fragment. cDNA insert direction is represented by red color with gradual changes: cDNA sense strand is from deep red to light red whereas cDNA non-sense strand is from light red to deep red. RECA-Type A is the case where the EcoRI restriction enzyme site is cut successfully by an endonuclease (restriction enzyme) while the XhoI site is kept intact. As a result, the vector fragment between the two recognition sites incorrectly remain in the vector, and the cDNA inserts can be inserted into the vector by ligating to the two sticky ends of the EcoRI cut-off site. Depending on how a cDNA insert is ligated to the resultant sticky ends, we can identify A1 and A2 sub-categories, as shown in Figure 3. In addition, we found an additional special case in which the adapter/linker fragments replace the cDNA insert in the ligation. This case is categorized as A3 sub-category and shown in Figure 2. Detailed illustration of two sub-categories of Type A Restriction Enzyme Cutting Abnormality (RECA-Type A). RECA-Type A indicates that EcoRI site of the vector is cut off whereas XhoI site is kept. A1 is the special case where cDNA is inserted with inversion while cDNA is inserted without inversion for A2. Because XhoI and EcoRI sticky ends cannot be smoothly ligated, so a random sequence fragment between the vector and cDNA end have been detected. Blue stands for the plasmid vector, yellow for EcoRI, brown for XhoI, red for cDNA, gray for a random sequence fragment, pink for Adapter1, and green either for poly(A) in sense strand of cDNA or for poly(T) in non-sense strand of cDNA. As shown in Figure 3, the double-strand cDNA insert is concatenated by the sticky ends of the vector in such a way that the sense strand (i.e., the one containing a poly(A) tail) and non-sense strand (i.e., the one containing a poly(T) tail) of the cDNA are ligated to non-sense and sense strand of the double-strand plasmid vector respectively. Consequently, the 5′-end sequence contains cDNA sequence in the non-sense strand with a cDNA terminal pattern like N + 3TNS-1 + V + 3TSS-2, whereas the 3′-end sequence possesses cDNA sequence in the sense strand with a cDNA terminal pattern like 5TNS-2 + V + 5TSS-1 + N. Here, V stands for vector fragment sequence and N for non-vector sequence. As shown in Additional file 1: Figure S2 A and B, the 5′-end sequence FLD1_38_A06.g1_A029 and 3′-end RTDR3_19_H01.b1_A022 exemplify this case. The 5′-end EST FLD1_38_A06.g1_A029 actually contains a 3′-end like cDNA sequence in the non-sense strand with a detected pattern of N + 3TNS-1 + V + 3TSS-2, whereas 3′-end EST RTDR3_19_H01.b1_A022 possesses a 5′-end like cDNA sequence in the sense strand with a detected pattern of 5TNS-2 + V + 5TSS-1 + N . In the GenBank submission, FLD1_38_A06.g1_A029 has not been trimmed of its 3TNS-1 component (i.e. CCTCGTGCC - Adapter1 and GAATTC - EcoRI site) at the end (http://www.ncbi.nlm.nih.gov/nucest/48933478). More importantly, it has been incorrectly designated as a 5′-end sequence while it actually represents a 3′-end sequence. In contrast to the aforementioned A1 sub-category, A2 represents the case where the sense and non-sense strands of the cDNA are ligated to the sense and non-sense strands of the plasmid vector at the EcoRI cut-off site – an insertion without inversion. Consequently, the resultant cDNA terminal pattern of 5′-end ESTs is 5TSS + N + V + 3TSS-2 (e.g. RTDR1_20_F07.g1_A015 and RTMNUT1_27_H12.g1_A029 in Additional file 1: Figure S2 C and D), whereas it is 5TNS-2 + V + N + 3TNS for 3′-end ESTs (e.g. STRS1_37_H01.b1_A034 in Additional file 1: Figure S2 E). As shown in Figure 3, after the vector is cut off at EcoRI restriction enzyme site, there are two resultant EcoRI sticky ends available in two ends of the plasmid vector (i.e. the yellow parts in the beginning and at the end of the vector). One of these sticky ends can ligate to the counterpart EcoRI sticky end of the cDNA insert (i.e. the yellow part in the front of the cDNA insert), and the other one should be available to ligate to the XhoI sticky end of the cDNA insert (i.e. the brown part at the end of the cDNA insert). However, the EcoRI and XhoI sticky ends cannot be ligated naturally and smoothly together. Owing to this incompatibility, interestingly, we have found that some uncertain random sequences, denoted by gray color in Figure 3, have been generated during the ligation between the EcoRI and XhoI sticky ends. Instead of a cDNA insert, adapter/linker fragments are found in some sequences to be ligated at the EcoRI cut-off site to the vector. In the example shown in Additional file 1: Figure S2 F, the 5′-end sequence NXRV076_A06_F displays the cDNA terminal pattern of 5TSS + 3TNS-1 + V + 3TSS-2, and there is no cDNA insert detectable around EcoRI cut-off site. Unfortunately, in the GenBank submission (http://www.ncbi.nlm.nih.gov/nucest/21689178), the region between 157 and 432 was taken as the final clean sequence, which was identified as a vector fragment sequence using our method. In Figure 2, similar to the RECA-Type A, there are two sub-categories whose definitions are based on whether or not the cDNA insert is inversely ligated at the XhoI cut-off site: B1 is for the insertion (ligation) with inversion (see NXRV_013_E07_F and RTDS1_2_A09.b1_A015 in Additional file 1: Figure S2 G and H for examples) and B2 for the insertion (ligation) without inversion (see RTFEPL1_26_F12.g1_A029, and RTFEPL1_26_F12.b1_A029 in Additional file 1: Figure S2 I and J for examples). As shown in Figure 2, sometimes neither of the two restriction enzymes is successfully cut from the vector and consequently no cDNA fragment is inserted. This case is exemplified by NXCI_011_D03_F and NXCI_029_D07_F in Additional file 1: Figure S2 K and L, both of which have a terminal pattern of 5TSS-2 + V + 3TSS-2. This type is a combination of RECA-Type A1 and B1. The abnormality appears to be caused by the fact that, after the cutoff at both EcoRI and XhoI sites, two cDNA inserts are inserted or ligated at both cutoff sites separately. Consequently, no vector fragment is actually cut off and removed (see Figure 2 D). Depending on the orientation of the two cDNA inserts, there are a number of complex sub-categories. Currently, one relevant terminal pattern that has been detected is N + 3TNS-1 + V + 5TNS-1 + N, exemplified by 5′-end sequence RTCNT1_24_B05.g1_A029 in Additional file 1: Figure S2 M.
The vector sequence fragment between the restriction enzyme recognition sites of EcoRI and XhoI should theoretically be removed from the vector, but our analysis shows that part of this vector fragment flanking XhoI recognition site still remains in some ESTs. One reasonable explanation of this phenomenon is that the restriction enzyme XhoI failed to cut off the vector at its recognition site (see Figure 2, Type E). As shown in Additional file 1: Figure S2 N, COLD1_26_G12.b1_A029 appears to represent this case, in which a 3′-EST displays the cDNA terminal pattern as 5TNS-2 + V + N.
Similar to RECA-Type E, when the restriction enzyme fails to cut the vector at the EcoRI site, part of the vector fragment flanking EcoRI site can be retained in some ESTs (see Figure 2, Type F). As shown in Additional file 1: Figure S2 O, RTCA1_14_E09.g1_A029 supports this case, showing that a 5′-EST can have a cDNA terminal pattern like V + N + 3TSS. 3TSS is not necessarily detectable due to either low quality sequence region or longer cDNA insert. Overall, we detected 1,087 EST sequences with RECA cases. Summing up all sequence numbers of each RECA types in Table 3, we can see that RECA-Type A (52.8%), RECA-Type B (21.8%) and RECA-Type C (23.0%) are the most common types. RECA-Type D, E and F account for about 1.7% of all cases, whereas all other unclassified, complicated cases make up about 0.6%. Of all the three labs, UGALGB has 765 RECA sequences and NCSUFBG has 322, whereas no RECA case is detected in the ESTs from TIGR_JCVIJTC. Interestingly, different labs have different RECA types. For example, RECA-Type A2, D, E and F are found in UGALAB ESTs but not in NCSUFBG ESTs whereas RECA-Type A3 and C are identified in NCSUFBG ESTs but not in UGALAB ESTs. Because the bona fide cDNA fragments in the raw sequences with RECA cases are difficult to determine unambiguously, these ESTs should be filtered out and subjected to further scrutiny before their deposition into the public databases like GenBank. Unfortunately, most of them have been submitted to GenBank by conventional EST processing pipelines that do not examine cDNA termini and their variations (Additional file 1: Figure S2 A–J, M–O). Previously, we reported abnormal ESTs with double-termini adapters (DBT) – a palindrome linker, made from two mutually exclusive terminus components (e.g., the adapter 5′ -CCTCGTGCC- 3′ from 3TNS, the EcoRI site 5′ -GAATTC- 3′ from either 3TNS or 5TSS, and the adapter 5′ -GGCACGAGG- 3′ from 5TSS, where 5TSS and 3TNS should be, in theory, mutually exclusive as per Figure 1), that could bring separate 3′ and 5′ directional sequence fragments together into a single, chimeric EST sequence [10, 11]. Detailed pattern analysis of these DBT ESTs reveals two distinct sub-categories, which we call Type 1 Concatenation and Type 2 Concatenation, and note that Type2 Concatenation is a novel finding in this study. As shown in Figure 4, Type 1 Concatenation possesses a sequence pattern of CCTCGTGCC + G + AATTC + GGCACGAGG, whereas Type 2 Concatenation has AATTC + GGCACGAGG + CCTCGTGCC + G. Type 2 concatenation indicates that Adapter1 in the sense strand can be connected directly to Adapter1 in the non-sense strand. Among 309,976 raw Pinus taeda ESTs, we found that 3.5% of the UGALAB ESTs (6,045 out of 172,229) and 0.9% of the NCSUFBG ESTs (681out of 75,001) have Type 1 Concatenation, while 2,515 from UGALAB and 741 from NCSUFBG possess Type 2 Concatenation. It is interesting to note that many ESTs have continuous, repetitive and mixed Type 1 and Type 2 Concatenations, as shown in Additional file 1: Figure S3 A and B. How many repetitions of such combined concatenations exist in a sequence? This might be a random effect involving complex biochemical reactions, because we have uncovered single-, double- and triple-DBT repetitions. Because of such complex concatenations, we might not be able to conclude that all DBTs will bring 3′ and 5′ directional sequences to form a single chimeric EST. For example, as shown in Additional file 1: Figure S3 B, FLD1_32_F06.b1_A029 has a complex concatenated adapter immediately before the 3TNS terminus: CCTCGTGCC (Adapter1 in non-sense direction) is connected to GAATTC (EcoRI site); GAATTC is concatenated to GGCACGAGG (Adapter1 in sense direction); GGCACGAGG is concatenated with CCTCGTCC again, which is part of the normal 3TNS terminus. In this case, all of the sequences should belong to 3′-directional sequences, not chimeric sequences at all. In fact, about 0.24% of 3′-end sequences of UGALAB have the pattern 5TNS + N + DBT + 3TNS with this feature. When processing this kind of sequence, it is appropriate to take only the region between 5TNS and 3TNS, excluding DBT, as the cDNA inserts. However, current processing pipelines have overlooked this abnormal terminus and submitted sequences including DBT to GenBank (Additional file 2: Table S1). Schematic view of double-termini adapters showing two types of concatenation. Current EST processing pipelines that do not examine cDNA terminal structures apparently do not have the ability to detect and filter aforementioned abnormal sequences properly before the GenBank dbEST submission. Using pattern analysis, we have created a unique EST processing protocol to determine the bona fide cDNA inserts within raw EST sequence reads generated by Sanger sequencing. 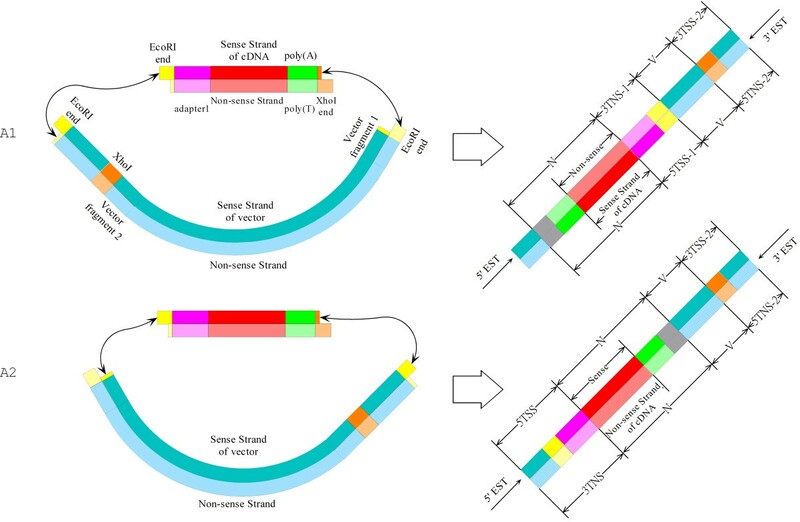 Based on this protocol, we developed a software tool called AFST (Abnormality Filtering and Sequence Trimming for raw ESTs) that can identify cDNA terminal structures, visualize sequence abnormalities, and trim ESTs properly. As an open-source tool, the executable and source codes of AFST are available online (http://code.google.com/p/afst). Implemented in Java with a MySQL or SQLite backend database, AFST allows users to load their raw ESTs in FASTA format, with or without a relevant quality file, and specify the vector sequence, adapter sequence(s), and the restriction enzyme recognition sites adopted in their cDNA library construction protocols. After execution, as shown in Figure 5A, AFST is able to provide a tabular result showing final clean, trimmed sequences and information about sequence abnormality such as DBT and RECA. Moreover, AFST can provide more detailed information about the cDNA termini (Figure 5B) and abnormalities detected (Figure 5C) for each individual sequence, and allow users to export results selectively for further data analysis. Besides the GUI version, we also create a command line version of AFST that can be easily integrated into existing bioinformatics pipelines for automatic data processing. Snapshots of AFST user interfaces. a: The main interface allows users to upload their sequences, specify relevant information about vector and adapter/linker sequences, initiate data processing, and obtain tabular results showing abnormality. b: Details of a normal sequence. The high-quality region between 5TNS-4 (from 2 to 62, marked with blue and green) and 3TNS (from 900 to 926, marked with pink, yellow and blue) is the final clean sequence (i.e., the region with a light red background). The color legends and their meanings can be found by clicking ‘color table’. c: Details of an abnormal sequence. This sequence has RECA abnormality (RECA-Type A1), where the double-stranded cDNA insert is inverted in its orientation and inserted into the double-strand plasmid vector after enzyme digestion. The vector sequence region between 5TNS-2 (highlighted with blue and brown) and 5TSS-1 (highlighted with yellow and pink) is the part that should have been cut off theoretically after enzyme digestion. In order to compare AFST with other EST cleanup tools or pipelines, we compared Genbank ESTs for two species with our processing results because these Genbank ESTs have been trimmed by other tools or pipelines. Of the 309,976 raw Pinus taeda ESTs, we carefully examined 230,783 GenBank ESTs that had been submitted by at least three different EST processing pipelines [1–3, 10]. We found that among them 5.2% (i.e., 11,986 ESTs) are “unclean” and 2.2% (i.e., 5,078 ESTs, including 3,180 that have DBTs) are abnormal, both of which could be cleaned or filtered by AFST. Moreover, two other popular tools for raw Sanger EST cleanup and trimming – Lucy [13, 14] and SeqClean  were adopted to process the 309,976 raw ESTs. Interestingly, among the final clean ESTs trimmed by Lucy, 55,993 (18.1% of 309,976) are still unclean, 3,789 (1.22% of 309,976) have DBTs, and of all the 1,087 RECA sequences, 771 ESTs (70.9% of 1,087) are unidentified. Meanwhile, among the final clean ESTs trimmed by SeqClean, 33,494 (10.8% of 309,976) are still unclean, 6,416 (2.1% of 309,976) have DBTs, and of all the 1,087 RECA sequences, 934 ESTs (85.9% of 1,087) are undetected. In order to demonstrate that our protocol performs well for cDNA libraries other than those in Pinus taeda, we reprocessed 38,709 peanut (Arachis hypogaea) ESTs from GenBank dbEST that utilizes pBluescript II SK as the vector and EcoRI and XhoI as the two restriction sites. Consequently, we found 25.3% (i.e., 9,785 ESTs) are “unclean” and 3.9% (i.e., 1,510 ESTs, including 259 that have DBTs) are abnormal using AFST. The ever-growing collection of EST sequences in GenBank is an important bioinformatics resource, providing crucial data for downstream applications related to gene identification, functional annotation, SNP and other polymorphism identification, and so on. Providing clean data is crucial if these applications are to be used to correct analysis. Although there have been significant efforts to filter error-prone ESTs, many GenBank ESTs are still problematic. As demonstrated in both this and previous studies [10, 11], current bioinformatics protocols and approaches do not explore the essence of potential EST data abnormalities from the perspective of cDNA library construction. Consequently, they have deposited a significant amount of unclean and abnormal ESTs into the public repositories and created potential problems for data-dependent downstream applications. Without inspecting cDNA terminal structures, existing EST processing programs fail to achieve sufficient data quality control and are unlikely to identify and remove common error-prone ESTs before GenBank deposition. In this study, we have adopted a novel pattern analysis approach that proves to be effective in identifying and distinguishing EST sequence abnormalities based on cDNA termini structures. This approach improves identification accuracy of the bona fide start and stop position of a cDNA insert within a raw EST sequence, thus significantly improving EST data quality. It also helps illustrate wet-lab abnormalities that can reveal potential error sources, such as a failure of one or both of the restriction enzymes to cut the plasmid vector, a failure of the restriction enzymes to cut the vector at the correct positions, the insertion of two cDNA inserts into a single vector, the insertion of multiple and/or concatenated adapter links, the presence of 3′-end terminal structure in designated 5′-end sequences and vice versa, and so on. In particular, the double-termini adapter (DBT) reported previously as one EST abnormality [10, 11] proves to have a novel variation (i.e., the Type 2 Connection) identified by the pattern analysis approach adopted in this study. Clearly, our pattern analysis approach and the relevant software tool AFST will help biologists diagnose the potential problems in wet-lab procedures and facilitate creation of more accurate data. We downloaded all 309,976 raw Sanger ESTs for Pinus taeda from NCBI Trace Archive (http://trace.ncbi.nlm.nih.gov/Traces/trace.cgi), which were generated by three different sequencing centers or labs including previously well-known TIGR institute. For these raw ESTs, we were able to collect the complete information about cDNA library construction protocol (i.e., plasmid vector, adapter or linker sequences, restriction enzyme sites, sequence name convention and associated sequencing directions), which is required by AFST to conduct accurate pattern analysis. In particular, 230,783 out of 309,976 ESTs were submitted by each center or lab into GenBank dbEST as final clean ESTs after raw EST cleanup and trimming. Therefore, this dataset represents a valuable benchmark for us to evaluate AFST performance. Also due to the availability of the complete cDNA library construction information, we were able to use two other popular Sanger EST cleanup tools – Lucy [13, 14] and SeqClean  to process 309,976 raw ESTs for performance comparison with AFST. In order to demonstrate that our protocol performs well for cDNA libraries other than those in Pinus taeda, we downloaded all Arachis hypogaea (peanut) ESTs (86,939) from dbEST, which were deposited by many labs and investigators. Among them, the biggest data set was 38,709, whose complete cDNA library construction protocol information (i.e., pBluescript II SK as the plasmid vector and EcoRI and XhoI as the restriction enzyme sites, etc.) was available by extracting and parsing dbEST records. Because cDNA library construction information is not mandatory for dbEST submission, it is often difficult to get complete cDNA library constructional information among dbEST records. Therefore, we used AFST to process 38,709 peanut ESTs and detect cDNA terminus patterns. In our pattern analysis protocol, there are three important concepts worthy of further explanation: Pattern, Confidence score and Reasonable pair. They are also implemented in our software tool AFST to identify abnormal sequences such as those with RECA and DBT and determine final clean ESTs. Type of cDNA termini. There are four major types of termini [5TSS], [3TSS], [5TNS] and [3TNS] as shown in Figure 1. Each of these termini can be further categorized into some sub-categories. For example, [3TSS] includes 3TSS, 3TSS-1, 3TSS-2, 3TSS-3, 3TSS-4 and 3TSS-5 (also see Figure 1). Number of cDNA termini. For instance, a sequence with just one [5TSS] and another sequence with two [5TSS] have different patterns. Sequential order of cDNA termini. For example, a sequence with first a [5TSS] and then a [3TSS] has a different pattern from another sequence that has first a [3TSS] and then a [5TSS]. Context of cDNA termini. Flanking region context refers to the sequence region immediately before/after a terminus. There are mainly two cases: vector fragment (represented by V) and non-vector fragment (N). Furthermore, vector or non-vector fragments can be further classified into vector fragment in high quality region (HV), vector fragment in low quality region (LV), non-vector fragment in high quality region (HN) and non-vector fragment in low quality region (LN). Context is one of the basis on which terminus’ confidence is estimated by computing a confidence score (see below). Because of sequencing errors [16–18], some in-silico identified cDNA termini might be false positives. When a terminus defined in Figure 1 is detected, we will quantify our confidence in its detection with a confidence score, which is calculated by considering the extent of the completeness of all required sequence elements, adjacent sequence contents (contexts) and the percentage of bases that match the whole terminus. Determine the completeness score for a given terminus (A score). The completeness score is directly reflective of the number of sequence elements in the terminus. For example, the completeness score of 5TNS, which has three sequence elements (i.e., a poly(T) tail, XhoI site, and VF2), is higher than 5TNS-1 and 5TNS-2, each of which have only two sequence elements. Comparing with 5TNS, 5TNS-1 and 5TNS-2, the completeness score of 5TNS-3 is the lowest one because it only has one sequence element. The terminus with the higher completeness score is more likely to be authentic, instead of being an artifact of a sequencing error. Score a terminus according to its flanking region context (B score). Sequence contents that match the expected structures in terms of a cDNA library construction protocol deserve a higher score. For example, we expect to detect a vector fragment sequence immediately upstream of 5TSS. Correspondingly, the vector fragment, the low-quality non-vector fragment, and the high-quality non-vector fragment detected immediately upstream of 5TSS will result in the highest (100), intermediate (50) and lowest B score (0) respectively, which will be assigned to the identified 5TSS. Confidence Score = weight A * A score + weight B * B score + weight C * C Score. Based on the expected cDNA terminus structure shown in Figure 1, if the cDNA insert is short enough, we should be able to detect both the 5′ end terminus and the 3′ end terminus in an EST sequence. This also means that we are able to detect a reasonable pair of cDNA termini for some ESTs, using the following definitions: (1) for a 5′-end EST, [5TSS] and [3TSS] is the reasonable termini pair where [5TSS] should be upstream of [3TSS]; (2) for a 3′-end EST, [5TNS] and [3TNS] is the reasonable termini pair where [5TNS] should be upstream of [3TNS]; (3) the distance between the two paired termini shouldn’t be too short to contain a cDNA insert (i.e. > = 200 bases). In our software tool AFST, essentially, we first determine all cDNA terminal patterns according to the type, number, order and context of all expected termini, and identify and filter out RECA and DBT abnormalities. We then search for reasonable terminus pairs, calculate confidence scores for all detected termini, and select the reasonable terminus pair that yields the highest cumulative confidence scores to delineate the start and end positions of the bono fide cDNA insert. Finally, the final clean sequence is obtained by trimming off both low-quality regions and vector fragments from the sequence fragment between the two termini of the best reasonable pair. Non-vector fragment in low quality region. This project was funded by the National Natural Science Foundation of China (No. 61174161), the Specialized Research Fund for the Doctoral Program of Higher Education of China (No. 20090121110022), the Fundamental Research Funds for the Central Universities of Xiamen University (Nos. 2011121047, 201112 G018 and CXB2011035), the Key Research Project of Fujian Province of China (No. 2009H0044) and Xiamen University National 211 3 rd Period Project of China (No. 0630-E72000). GJ and CL managed and coordinated the project. SZ carried out main implementation and data analysis. XL, PL and JM contributed to some implementation. JK contributed critically to manuscript editing. All authors participated in manuscript writing and editing. All authors read and approved the final manuscript.